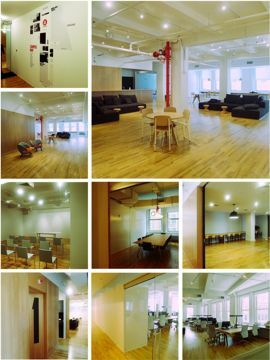 A New York City co-working space called General Assemb.ly has been lending its desks to highly regarded startups and serial entrepreneurs for several months now, including: Postling, Art.sy, SeatGeek; and the co-founders of Etsy and Vimeo respectively, Chris Maguire and Zach Klein. This weekend, the company replaced their single web page with a full-fledged site. Today, the company announced that it has received a $200,000 grant from NYC’s Economic Development Corporation (NYCEDC) to offer design, technology and business classes to the public. Located in Manhattan’s Flatiron District, General Assemb.ly includes an event space with capacity for 200 attendees, a 35-person classroom, a library, seminar rooms, a media facility, kitchen and bar, mailroom, lockers, a bike storage area and two work spaces for its invited members. It’s designed as an “urban campus.” School will open there on February 1, 2011 with classes priced from free, sponsored sessions to several-thousand-dollar, ten week workshops according to company co-founder Adam Pritzker. “In a city like New York, it’s still very difficult to work and live around other people who share a sense of creativity, and want to have an impact on the world whether it’s in the sphere of technology, design or business. [GA is] a physical space for creative people to learn from one another and conspire. I haven’t seen anything like it in or around New York. General Assemb.ly is also supported by corporations including design and innovation consultants IDEO, Skype, Silicon Valley Bank, Rackspace and Wilson Sonsini. 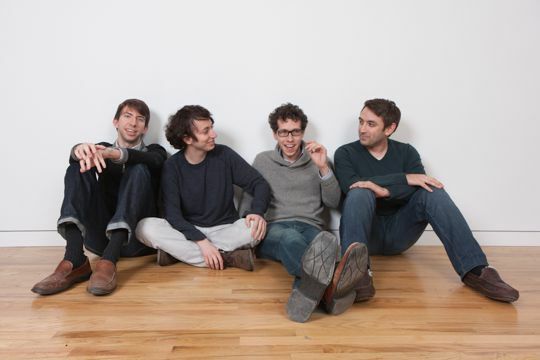 The co-founders of General Assemb.ly — Brad Hargreaves, Adam Pritzker, Matthew O. Brimer and Jake Schwartz (left to right in photo, above) — initially determined the members of their club by word of mouth recruiting and personal interviews. Demand was so strong that the space already boasts a waiting list of 100 entrepreneurs hoping to become communal members. Pritzker reported that in the next wave, his company will adopt a more formalized process, including an application and review by an advisory board to bring in future tenants and communal members. Startups currently pay $500 per desk for dedicated memberships; communal members pay $300 per month; and Programming Members pay $25 per month for levels of access to the space and some of its events. General Assemb.ly plans to offer 30 to 50 classes a month, including one keynote lecture each week when its business is up and running in full.